Akha Woman, Akha Village in Chiang Rai Province, Northern Thailand. Villages of these colourful people are to be found in the mountains of China, Laos Myanmar (Burma) and northern Thailand. There are approximately 20000 Akha living in Thailands northern provinces of Chiang Rai and Chiang Mai at high altitudes. This tribe originate in Tibet. Every Akha village is distinguished by their carved wooden gates, presided over by guardian spirits. They life in raised houses on low stilts, with a large porch leading into a square living area with a stove at the back. The roof is steeply pitched. They life on marginal land and find it difficult to eke out a living through their slash and burn method of agriculture. In order to supplement their income, many Akha are now selling handicrafts, employing the traditional skills used in making their own clothing and cultural items. Akha women spin cotton into thread with a hand spindle, then weave it on a foot-treadle loom. The cloth is dyed with indigo, then sewed into clothing for the family. The women wear broad leggins, a short black skirt with a white beaded sporran, a loose fitting black jacket with heavily embroidered cuffs and lapels. The black caps are covered with silver coins. 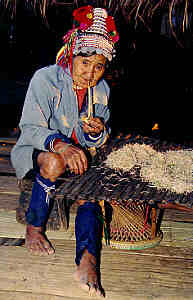 Akha men and women produce various decorative items of bamboo and seeds. The men make crossbows, musical instruments, a variety of baskets, and other items of wood, bamboo and rattan. The Akha are deeply superstitious, their religion prescribing exactly how each action should be performed. 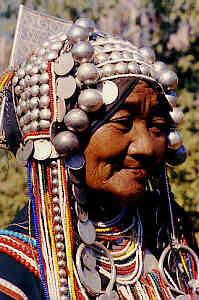 This tribe is the poorest of the hill tribes, but well known for their extraordinary costumes and exotic appearance. Click here to visit the sponsor of Thailand online. This page was created on March 21, 1997 and last updated on April 11, 2004. Diese Seite wurde am 21. März 1997 gestaltet und zuletzt am 11. April 2004 aktualisiert.